On Sunday I flew from Portland to Atlanta. The flight was excessively long, but not unpleasant. My body was propelled at hundreds of miles an hour tens of thousands of feet in the sky for four and a half hours. If you took the planes away, I would have been superman, one in a fluctuating population of people living in the sky. I’m unable to find any reliable statistics for how many people are flying at any given moment, but one source claims 300,000 Americans are sky-high during the daylight hours. 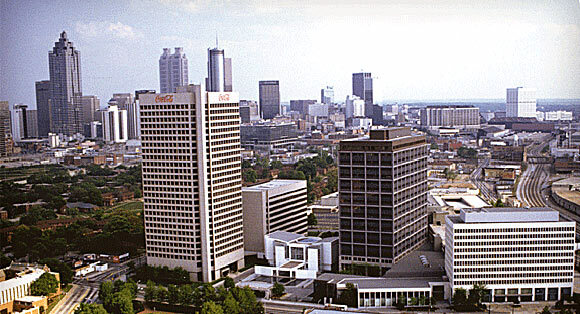 Atlanta is home to a few Fortune 500 companies, including my destination: Coca-Cola. I expected an multinational mega-brand to have an enormous and bold headquarters, but Coke’s office complex is a hodge-podge of generic buildings loosely surrounding a pleasant but plain courtyard. The entry atrium looks like a cross between convention center and mall architecture, and visitors are funneled through a security checkpoint that feels like a 9/11 afterthought. The layout of the buildings is confused by no central entrance or focal point, and rather than feeling like a predetermined campus, it feels more like Coke simply bought out all of the buildings in an office park an put a wall around it. Despite all the free soda, it’s a disappointing space. A coworker and I, along with clients from Powerade, presented ideas to CBS for in-game enhancements for their NCAA broadcasts. It was nerve-wracking to talk to a room full of suits, but I did okay (Note: I wasn’t wearing a suit). The meeting we joined had been going since 8:30 that morning, so most of the attendees looked exhausted. But beyond that, there was a secondary mood of sadness. It looked like that not only was the meeting boring, but that their whole career was draining their life force. All jobs do this to some degree, but I could feel it in them. I can feel it in me. I lodged at the Four Seasons Hotel. I don’t feel entitled to luxury on business trips, nor do I want it. Strangers pampering me is disconcerting. David Foster Wallace describes this unease perfectly in his titular essay from A Supposedly Fun Thing I’ll Never Do Again. While written about a cruise ship experience, it applies to a luxury hotel. Professional care and courtesy is unsettling because it isn’t genuine. A service smile is not a real smile. Staying in a luxury hotel is like hiring a prostitute, except that it only strokes your ego (Note: This an educated guess). In effect, you are paying for lies. All by the book and insincere, but I bet that most of their customers would flip out if the receptionist messed up her routine. Business travel is a good chance to look at other business people. I don’t understand how they can care about such mundane issues while being tethered to a Blackberry at all hours of the day. Or flying from office to office to talk about so and so widget or chart with other equally interchangeable people. This is not the life for me, and I am confused by how it can be the life for them. Planes, offices, and hotels are soul-sucking. I flew back Monday night. Meaning that in less than 24 hours I had been across the country and back.